Ruchi: Award And Me me..
Its awards time again A new blogger friends of mine again gave me such recognition this week. 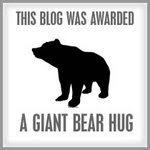 Vegetable Platter has awarded my blog A GIANT BEAR HUG :):). Giant big big hug to U . My friend Sireesha passed me the Nice matters blog award. I am so happy to receive this wonderful awards from both of you. Thanks sooo much to both of you for thinking of me passing this award to me and receiving award from both of you is a great honor. I am so excited and happy to share my awards with u all. Thank you so much MV..Loved your khandvi..
thankyou sripriya for yr award. Thank you suma.I too happy to pass this award to u& all.